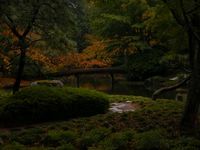 view across Nitobe Gardens pond.. might be a little dark in this version... sorry about that. Japanese lantern with Fall colours. Two weeks until the main event!